Urbanized, I'll hand it to you, you spin well. The fact is that I don't need to know what people do for a living or anything else. I knew that you WERE close to the downtown power structure, I hadn't read that you had openly talked about this. Your cheerleading for all things downtown, including what many here believe to be fishy at best, seemed to be a good time to discuss why you might possibly support all of these things that seem indefensible to some of us. I don't have a problem with logic, I agree with you about the internet truly ruining our country with the lack of civil discourse, and I don't think anything I have written rises to that. I thought it relevant. You seem to want to portray your job as just another guy trying to make a buck (your new signature? ), but you are actually a spokesman and manager for the taxi business and that includes your role in the financial arrangements involving the power structure. Again, to me, knowing what I know, that is relevant to your supporting so many things many of us simply cannot defend. I'm sorry if it sounds like an attack, I mean it only as a possible explanation for your never (rarely?) bucking the powers-that-be. In my mind, YOU are the one blowing this up. Asking for challenges, giving all the info you did, asking for mine, and really making a huge deal over an observation that many might might hold given the facts. One that you are free to rebut of course, but you have gone well beyond that. But, you already know that. You felt the need to attack an observation that any logical person could possibly arrive at. Rebut, but don't blow it up and turn this around. Making it about me only makes you look like you protest a bit too much. Back to open meeting violations? And entities formed to get around problematic discussion - in private? Me too. Oh right. They're given a day to get informed. I can't think of too many legislative bodies which put votes like this on a consent calendar. They can't even put these things on new business and wait til the next meeting to vote? These may all be perfectly legitimate deals, but this city has a long history of corrupt spending of taxpayer dollars. We have open records/meetings laws for that very reason. If today, there is nothing shady going on whatsoever, I guarantee you it won't always be that way when you have a system to allow for the spending of public money for private ventures with very little if any oversight. Please. Mr. Blue Sky, you come in and attack a person’s character as a means of arguing your point and then throw up your hands and act innocent, shocked - SHOCKED I SAY - that they might wish to defend themselves against your smear. This is EXACTLY what is wrong with Internet discourse. If you had posted here for more than three months maybe you’d understand that over the past ten years I have made MANY posts critical of how we do things in this city. I call things the way that I see them, but this includes an acknowledgement that experience is usually an asset, and an overall belief that MOST of Oklahoma City’s public servants and leadership are highly-qualified and working for the benefit of our city, even if at times I disagree with an approach someone might take. It must be a sad and frightening world to live in indeed where there are vast conspiracies and corruption lurking around every corner. I think you have established at this point that you have zero intention of letting us know who you are or what connection (if any) that you might have here; all while speaking out of the other side of your mouth and suggesting we somehow have a right to know what posters here do for a living and especially that someone has zero credibility if they have any connection to downtown’s leadership, no matter how remote. Got it. But for the record, to your original post which centered around an alleged lack of disclosure, I am 100% transparent. While you remain 100% opaque. Readers are invited to judge for themselves. Please cite specific examples of this. I never expected that kind of reaction! I wasn't doxxing as doxxing is actually giving the information that you gladly provided. Personal? Not really. When I see your posts and I see the constant cheerleading for the power structure, I call it carrying water. You don't. That's fine. I think it's very relevant to the conversation that you are a connected member of downtown leadership. Do you not see the relevance? Really? If not, and you insist it's personal, I'm sorry. I never expected to touch a nerve quite like that, Urbanized. When you attack his credibility it sure is personal. He has done nothing on here but try to actually explain with facts and Information vs. suspicions and innuendo. I think Urbanized has earned his stellar reputation here for credibility, intelligence, and fair mindedness. So, now that Urbanized explained his identity and points of reference and why he has credibility, why don’t you do the same. Or whose pail of water are you carrying? Other than having an “opinion”’, what gives you insight to challenge his credibility? By the way, this includes Ed Shadid - the individual at the center of this thread topic - about whom I’m pretty certain I’ve never posted a critical word. I believe that he believes he is working for the benefit of the community, even if I at times disagree with his assessments and/or methods. I DO take issue with the statements his attorney made in the KFOR report which mentioned “(lining) someone’s pockets,” which I think is reckless and harmful rhetoric without a shred of evidence to this effect. I believe and hope that if Ed himself had been available for interview that he would not have said such a thing, as his statement made no such allegations. I think you're way out of line here. Agree or disagree with the potential lawsuit, Urbanized is a well respected member of this community and has a track record of being very transparent. He shouldn't have to change his online signature to please you. I really only changed my signature to be funny and obnoxious though. What's crazy is you and I have had lunch. You met my father who is a former assistant attorney general who prosecuted this stuff back in the day. Here's a case. That same group built Presbyterian Tower with taxpayer funds and sold it to that same group for something like $5,000 or so. Did you think we were kidding? OKC has a history of corruption. This is well known. It serves no one to deny it and it only makes you look like you don't know our recent history when you demand proof. When I said please cite examples I had no doubt that you could pull up ancient examples of corruption in government. Most specifically there was a terrible scandal at the county level in Oklahoma in the seventies. There is a long history in state government, and I am never surprised when new scandals crop up on the state level. The Oklahoma County Jail project was a major scandal in the late eighties. By the way thanks to the jail - and the public’s inability to discern between county and municipal government - it was very difficult to pass the first MAPS. While it’s healthy for the public to care about government and be involved, blanket distrust based on a misunderstanding of civics and misattribution of bad behavior can be paralyzing and unhealthy. But there has been little if any evidence of corruption in OKC’s government at the very least since I moved here in 1986. Certainly no significant “corrupt spending of taxpayer dollars.” This is hyperbole. The case you cite is from 1980. Most of the actors are dead. And as far as I can tell (I’m not a lawyer and only skimmed) that particular case was related to record keeping and keeping proper office hours..? I mean, im sure there was more to it, but where are the criminal prosecutions? You’ve got me at a disadvantage regarding lunch. I’m sure it happened but I’m trying like heck to remember it. What can I say, I’m 50. How long ago was this and what was the context? The point I was making is that there hasn’t been so much as a hint of “lining pockets” or any of the other words being tossed around on this board in at least a generation. That means something. Or at least it should. But again, by all means, make the issue about trying to discredit me, the guy who simply links to state laws and CPA websites explaining the purpose of public trusts. Seriously, I hope the issue is contested and decided one way or the other so that I can go back to simply being hated here for explaining how more loading docks will help secure more convention bookings (and why we as taxpayers benefit from convention bookings). Perhaps I should have been more specific: can you cite specific examples of “this city[s]... ...long history of corrupt spending of taxpayer dollars” which have occurred within the past 30 years or so (heck, even 35), and/or which have occurred under the watch of the past FOUR mayors, FOUR city managers, or any current city council members? Not even saying they don’t exist, but I sure can’t think of any. Like I said, that should count for something, but apparently it doesn’t on the Internet. Good grief that opinion is some excutiatingly dry reading. I would have made a terrible attorney. I may have you confused with someone else I've met from this board. At any rate, yes, back in the early 1980s and late 1970s, the case I cited was just part of the prosecution of the Oklahoma Industry Authority, a creature of statute, which was created for the same purpose as Alliance--as an entity to incentivize the expansion of industry within the State of Oklahoma. The Authority was comprised of the state/city fathers at the time, the Gaylords, the Kerrs and McGees--the ruling class at the time. The case I cited was basically the tip of the iceberg. To cover up their activities, this group kept records in different locations all over the place. None of those places kept regular hours. This was done for the express purpose of making it damn near impossible for anyone to find out what was going on. Alliance is much more effective in this regard. The Oklahoma Industry Authority was responsible for the construction and subsequent sale of the Deaconess tower for pennies on the dollar to members of the Authority. They maintained a flurry of public trusts designed to keep the public in the dark. When the Underground was built downtown, coincidentally, all of the buildings owned by members of the Authority got connections to the underground, etc. The only thing they did which I can recall which actually expanded industry in Oklahoma was incentivizing the GM plant in MWC with the promise of the land being tax exempt. The Attorney General at the time, Jan Eric Cartwright, knew the scheme was illegal and his first term was spent unwinding many of the Authority's deals. Yes, the County Commissioner scandal was going on at the same time, but that was an entirely different ballgame. Cartwright's second term was going to be spent criminally prosecuting all of these city fathers. Needless to say, the editorial board of the Oklahoman wasn't about to stand for E.K. Gaylord going to the pokey, so they ran about the most extreme campaign against Cartwright and in favor of Mike Turpen, with nearly daily front page editorials until the anti-business Cartwright was defeated in the primary. Not surprisingly, all of the business surrounding the OIA just went away. NORMAN — Attorney General Jan Eric Cartwright, in an _infrequent political speech Wednesday night, attacked Edward _L_. Gaylord, editor and publisher of The _Oklahoman and Times, during a rally of 150 _supporters. _Cartwrrght talked less than _two-minutes during the _watermelon and soft drink _fund-raiser_, but spent that time comparing _himself and Gaylord. One thing about _Eddie Gaylord and I—he and I are a lot alike," _Cartwright said. "I'm an elected official who works for the people, and he is a trust official who works for himself." 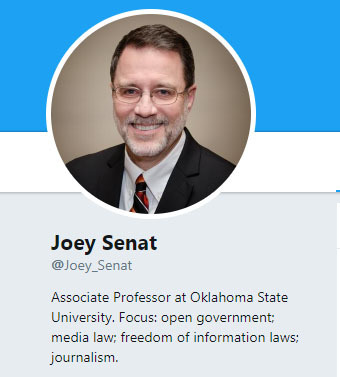 Cartwright added that while _he, as a state _official, follows Oklahoma's Constitution, Gaylord "writes his own constitution and keeps it a secret." With that, Cartwright ended his speech saying, "Thank you very much." _.The _fund-raiser at Norman's Andrews Park was staged by a group of Norman supporters that charged $1 for a slice of watermelon and 50 cents for soft drinks to raise money for the Cartwright campaign. - _. Gene _Tyner_, a representative of the Sierra Club who was master of ceremonies, said he could not say how much money was raised for the candidate, but in assessing _. _Cartwright_'_s chances in Cleveland County said, "I think _^_he will do well. It's a pretty well-informed electorate." After the speech, Cartwright was asked why he did not talk more about his campaign for _re-election and his battle with Mike _Turpen of _Muskogee for the Democratic nomination. He responded, "I learn more by visiting with the people and hearing of- their concerns over taxes and concerns for equal treatment by the government." Cartwright, who mounts a very modest campaign each election, said he feels good about his contest _. with _Jurpen_, but that. "I always keep looking_, over _;my shoulder." _Mike Williams, _.who _.is handling _Cartwrights_? campaign advertising, said a $28,000 _television series of ads began running Wednesday, and Cartwright is now trying to raise money for newspaper and radio appeals. My whole point here is that there is a reason we study history--it has a tendency to repeat itself. In Oklahoma, we set up procedural safeguards to protect us from repeating our mistakes. Now this crop of city fathers might be noble and have motives as pure as can be, but a student of history would at least be skeptical of that. Yeah, not everything can be a Scalia dissent, but this case is important because it is why Alliance is a private corporation rather than a Public Trust. This is a very intentional effort to avoid open records laws and we have to be on guard for that sort of thing. Even if those in charge are using this mechanism for perfectly permissible purposes, that doesn't mean that tomorrow's leaders will use it to advance their own ends. It's dangerous and if it was misused, it could unravel the public's confidence in our public institutions, which sounds silly to those outside of OKC, but within OKC, we have a high degree of confidence in these administrations which has allowed this community to make the huge advances it has made over the last 20 years. I don’t really disagree with what you are saying for the most part (people seem to be misinterpreting my posts as blanket endorsement of keeping the public in the dark and/or non-transparent government). Government MUST be accountable to the people. Jumping straight from "I don't like a loophole in state meetings laws and feel like it is being exploited" to "these people are crooks" - despite zero evidence or legitimate allegation - is disingenous, paranoid, and slanderous. THIS so much. There's gonna be a day where some people are going to be surprised when their chickens come home to roost for their comments on boards and social media. Having a hidden screen name doesn't make you immune from consequences, and it may not be immediate, but as James Gunn learned this weekend, there are consequences for you online behavior. I never made that jump. I'm just stating that there's tremendous historical precedent to suggest that left to their own devices, people can be crooks and I'd rather not leave them to their own devices. The current leadership may be perfectly trustworthy. That doesn't mean the leadership will always be trustworthy. We need checks and balances to protect the public from bad leadership. It's hard to see a need for that when you are experiencing good leadership. This attack on Urbanized is almost comical. He isn't part of some sort a cabal simply because he has a positive spirit about what is happening downtown. His is hard earned. He has been part of this city's transformation now for several decades. If you want a glimpse of what people vital to our city's downtown operation are like, look to Urbanized. Sometimes the boosterism makes me want to gag, but ten years on the streetcar project has made me a bit cynical. The critique regarding the culture of how things are often done with city management decisions is accurate. I'm glad that his experiences haven't given way to cynicism. It brings balance and perspective to the forum. Thanks for being here. Just because someone is positive doesn't mean their part of some hidden conspiracy even if their world-view doesn't match yours. Also, I don't necessarily disagree with anything you are saying here; especially the last three sentences. Nor did I say that you personally had made the jump. But obviously a number of people here HAVE done this; those responses are potentially damaging to our community, and I don't believe they should remain unchallenged and left to fester. It's also telling that in some instances the method of defending such positions is not by citing sources but instead via ad hominem "kill the messenger" type attacks, which are the calling card of a losing argument. Thanks for the kind words, Jeff. I know you have yourself put in tremendous effort for our city and also have had to hack your way through a fair share of bureaucracy, red tape, turf battles, silo effects and other frustrations that occur when dealing with government. I myself have been a part of many instances which have frustrated me, left a bad taste in my mouth, made me question priorities and the like. I laugh and roll my eyes when people believe I'm some sort of blind booster; just as I know some people in leadership probably roll THEIR eyes when they see me walk into a meeting or get an e-mail from me. Governing is not easy; it's a messy business. By design, in fact. I just know that in years of fighting these various battles I personally have rarely been exposed to individuals who I believed were working for their own interests (other than their own political interests/ambitions) or against something they believed in their heart - no matter how misguided - to be the best interests of the City. I am far more concerned with individuals in government who might be apathetic, just going through the motions, or who stubbornly rely on old mindsets and practices when making decisions. I second this, especially after talking to him in person a few times. He’s easily one of the most respected posters here. I'll be interested in seeing how this goes. I was on the board for a non-profit, where a group of people that called themselves the 4 horsemen would regularly meet in private. They didn't represent a quorum, but they would plan how they'd push or vote on issues, and it wasn't hard in the open meetings for them to get an additional vote or 3 and get a majority. Technically, this was still within the rules though. They were just "socializing" or "having dinner". This seems to mirror what Shadid is accusing of happening here. I'm not a big fan of his, and I'm not sure of how this will go, but it will be interesting to watch. This +1!! While I don't always agree with Urbanized, he always presents a well-measured/thought through position.